WASHINGTON, DC, September 2, 2010 (ENS) – A federal judge has ordered the U.S. Fish and Wildlife Service to revise a Bush administration recovery plan for the threatened northern spotted owl, and the agency said today it intends to release a draft of the revision next week. U.S. District Court Judge Emmet Sullivan ruled Wednesday that the Service must come up with a revised recovery plan within nine months. The northern spotted owl is a medium-sized nocturnal bird that inhabits old-growth forests of western North America, including parts of northern California, the Pacific Northwest, and British Columbia. The owl’s conservation status and need for critical habitat in the Pacific Northwest has been contentious ever since the bird was listed as threatened 20 years ago because it nests in old growth forests prized by the timber industry. Judge Sullivan also ordered revisions to the amount of land allowed to the owl as critical habitat. The area set aside for owl conservation had been cut in 2008 during the Bush administration by 1.6 million acres in Washington, Oregon and Northern California. This decision was tainted by political influence by Former Deputy Assistant Secretary Julie MacDonald, who resigned in disgrace in May 2007 after a scathing report on her influence-peddling was issued by the Interior Department Inspector General. MacDonald had jurisdiction over the Fish and Wildlife Service. 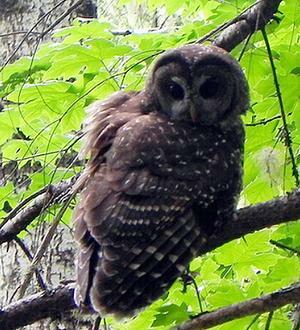 The Inspector General’s report noted the influence of MacDonald on 20 Endangered Species Act decisions and actions, including the recovery plan for the northern spotted owl. The Service said Thursday it had already begun a revision of the recovery plan and intends to release a draft plan for public comment next week and finalize it later in the year. The Obama administration had asked the court to vacate the 2008 critical habitat designation and revert to a 1992 plan that set aside 6.88 million acres, a lot larger area, for northern spotted owls. Judge Sullivan denied that request Wednesday, instead leaving the 2008 critical habitat designation in place while ordering its revision.